Toyota is denying a CNN report yesterday that said Toyota's engineers told the Japanese automaker in 2006 they found faulty software that led to sudden unintended acceleration in tests. CNN, citing a thrice-translated internal memo, reported tests of a pre-production model showed the failsafes for the electronics that governed the vehicle's cruise control needed to be enhanced. Toyota claims it deliberately introduced the error to test its systems and CNN had mistranslated the document. Non-Toyota automotive engineers we've spoken to tell us they're more inclined to believe Toyota here as this is a standard testing practice on pre-production vehicles. Also, the Tundra wasn't one of the vehicles reportedly showing huge reports of SUA occurrences. 3rd Gear: Is Chrysler's 'Imported From Detroit' Tagline A Lie? David Shepardson of the Detroit News reports this morning that apparel and gifts company Pure Detroit claims Chrysler's "Imported From Detroit" marketing campaign amounts to false advertising, since the vehicles it promotes aren't made in Detroit. In court papers filed this week, as part of its ongoing legal dispute with Chrysler over the slogan, Pure Detroit notes that no Chrysler products are actually assembled in the city of Detroit. The Chrysler 200 is built in suburban Sterling Heights, and the Chrysler 300 and Chrysler Town & Country are built at assembly plants in Ontario. Fans of Detroit's iconic ruined auto plants are getting some heartbreaking news this AM from The Detroit News. Dominic Cristini, the owner of the Packard Plant, said he wants to start demolishing the Packard Plant within a month. I has a sad. But, Curbed Detroit has a stellar gallery of photos of the plant. Go view them here. According to ESPN, Roger Penske is moving his team from Dodge to Ford in 2013 to "give it the best opportunity to compete for a Sprint Cup championship," he said Thursday after announcing the move. 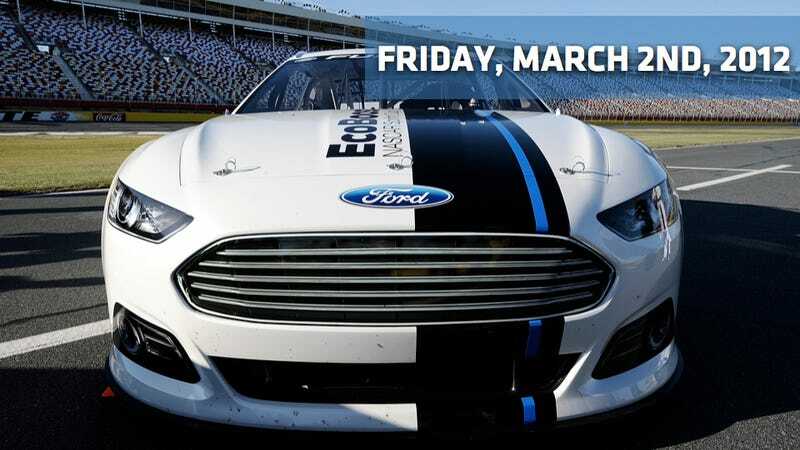 Penske's teams will run the newly-restyled Ford Fusions in the Sprint Cup Series and Ford Mustangs in the Nationwide Series, starting next season. His organization, which fielded Fords from 1995 to 2002, switched to Dodge in 2003. Penske said being associated with Ford "gives us a chance to make sure we can beat any team in NASCAR in the future.'' Which means, I guess, that being with Dodge means they wouldn't. World Car Fans has the first shots of the new Seat Toledo Concept that will be unveiled at next week's Geneva Motor Show. The concept, based on the Volkswagen Jetta, is pretty close to what we should expect from the production model. The sedan features the style that has been developed through the IBE, IBX and IBL concept cars, progressing to what you see before you now — a rather bland-looking four-door. Sort of like the city of Toledo, Ohio it's not at all named for. Except, you know, Toledo, Ohio has the Jeep plant. So there's that it's got going for it.